However, there were a number of more technically savvy folk about who were snapping away merrily and have photos on their blogs, including the official Mantic piccies, the not even slightly odd Ninjabread, and (soon) tearsofenvy. Mantic are getting increasingly organised about these events, and this one had several demo games of Warpath running all day. If you’d been there, you could have played. There were also model displays, artists and sculptors to talk to, painting clinics with Golem Studios, seminars with Ronnie and Alessio and, of course, the Secret Room with all the upcoming goodies in. Is the naming of the DKH3 Dwarf Driller rules coincidence or a film ref? The new sci-fi board game: is it a close port of DKH, or really different? I was there all day, but spent a couple of hours with Leon being interviewed and chatting in a corner. Sorry I missed you. Sci-fi. It’s not finished yet, so nobody knows, though I would expect it to end up being obviously related. As Alessio and Ronnie mentioned when asked a similar question about KOW/WP similarities in a seminar, there is a value to having a sort of “house style” in terms of game design. With that in mind, plus the fact that everyone seems to quite like DKH, I thought I’d start in a similar place. However, it may end up being very different as the genre requires quite a different approach to really work. Fantasy games like DKH are mainly melee games with a bit of shooting; SF games are (by and large) shooting games with a bit of melee. What works well one way round may prove to be a bit feeble when reversed. Yep, Ravage is one of the last surviving TT-magazines and a good one! The whole question of the future of print magazines is an intriguing one. Perhaps it’s another post/debate. I was there, found it to be quite poorly organised actually – there seemed to be a distinct lack of room and, when I did try to get a game of Warpath there were several table free but no-one appeared to be around to run it? The space was an issue (ironically). They’re getting ready to move to the factory base properly and so have loads of workmen ripping things up there. I’m surprised you couldn’t find anyone to run something as there seemed to be dozens of people hanging about in Warpath T-shirts to do just that. I suppose it depends on which bit of the day you’re talking about though. I’ll pass on your comments. I enjoyed the morning, space was a problem. But the demos were flowing well all morning. 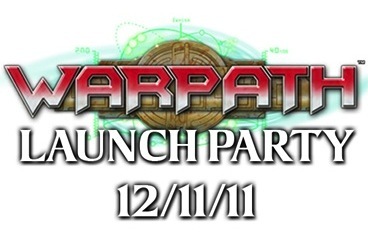 It does look like warpath has been chucked out a bit quick. I’m sure it will all come good. It was around middayish – maybe they’d all gone to get lunch? Ironically we decided it was too stuffy in there and instead went up the road to GW HQ – say what you like about the company, the bar there does some pretty tasty (and horrifically unhealthy) food! Thanks for the Golem shout-out. It was great to chat to you about your game design history. I’m off to scour eBay for Lost Patrol.